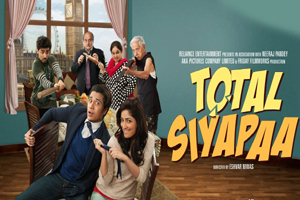 Total Siyapaa is a 2014 Bollywood romantic comedy film directed by E. Nivas, written by Neeraj Pandey and produced by Neeraj Pandey, Shital Bhatia. The film stars Ali Zafar, Yaami Gautam in lead roles, while Anupam Kher, Kirron Kher, Sarah Khan, Vishwa Mohan Badola, Anuj Pandit plays a supporting roles. The soundtrack of the film is composed by Ali Zafar and lyrics are penned by Ali Zafar, Kumaar, Bulleh Shah, Aqeel Rubi. Here is the link of all the songs lyrics and videos of Total Siyapaa.